Considering the immense fragmentation that characterizes the mobile apps industry, it’s good to see decent research help us try and make sense of what’s going on in that particular part of the digital economy, one that is consistently growing in size and importance across the globe. Hence, I invite anyone with a vested interest in the mobile developer ecosystem to check out VisionMobile’s extensive research report (sponsored by Telefónica Developer Communities) on that very subject, because it’s easily one of the most profound I’ve read to date. 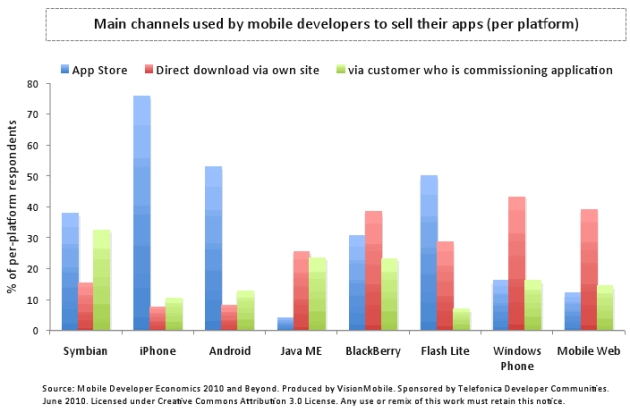 The report, which is based on extensive research conducted by a team of three researchers, five interviewers, and eight mobile application developers between January and June 2010, provides insights into all the touchpoints of mobile app development, from platform selection to distribution and monetization. – Market penetration is hands down the most important reason for selecting a mobile platform to develop for, chosen by over 75% of respondents across each and every platform. Clearly, developers care more about addressable market and monetization potential than any single technical aspect of a platform. – Based on its sample of 400 respondents, VisionMobile found that most developers work on multiple platforms: 2.8 platforms per developer on average, even. Among iPhone and Android developers, one in five releases apps in both the App Store and Android Market. – In the last two years, a mindshare migration has taken place (see details here), with mobile developers moving away from “incumbent” platforms, namely Symbian, Java ME and Windows Phone. The large minority (20-25 percent) of Symbian respondents who sell their apps via iPhone and Android app stores reveals the brain-drain that is taking place towards these newer platforms. – According to VisionMobile, the vast majority of Java ME respondents have lost faith in the “write once, run anywhere” vision. Moreover, anecdotal developer testimonials suggest that half of Windows Phone MVP developers (valued for their commitment to the platform) carry an iPhone, and would think twice before re-investing in Windows Phone. – Android stands out as the platform most popular among mobile developers. Survey results suggest nearly 60 percent of all mobile developers recently developed on Android, assuming an equal number of respondents with experience across each of eight major platforms. Second in terms of developer mindshare is iOS (iPhone), outranking Symbian and Java ME, which were in pole position in 2008. – Platform characteristics reveal a disconnect between developer mindshare and addressable market for each platform. For example, the Symbian OS is deployed in around 390 million handsets (Q2 2010), and claims over 6,000 apps, while Apple’s iPhone has seen 30x more applications while being deployed at just 60 million units over the same period. – Evidently, most developers have a strong affinity towards the platform(s) they have invested time in; across all eight major mobile platforms surveyed, respondents felt that the best aspect of their platform was the large market penetration, even if the actual market penetration was relatively small. – Market channels that were mainstream a couple of years back take only a small chunk of the go-to-market pie for mobile apps today. Operator portals and ondevice preloading through OEM or operator deals is the primary channel to market for fewer than five percent of mobile developers surveyed. Research findings show that developers resort to either ‘native’ app stores, or to direct download via their own websites – in addition to the traditional model of bespoke app development. – App stores have reduced the average time-to-shelf by two thirds: from 68 days across traditional channels, to 22 days via an application store. Moreover, app stores have reduced the average time-to-payment by more than half; from 82 days across traditional channels, to 36 days via an app store. On average, it takes 55 days to get paid via an operator channel, or a staggering 168 days when on-device pre-loading via a handset manufacturer. – There is little use or availability of app stores outside the Apple and Android platforms. Only five percent of Java and just over 10 percent of Windows Phone respondents reported using an app store as a primary distribution channel. – The key challenge reported by mobile developers is the lack of effective marketing channels to increase application exposure and discovery. 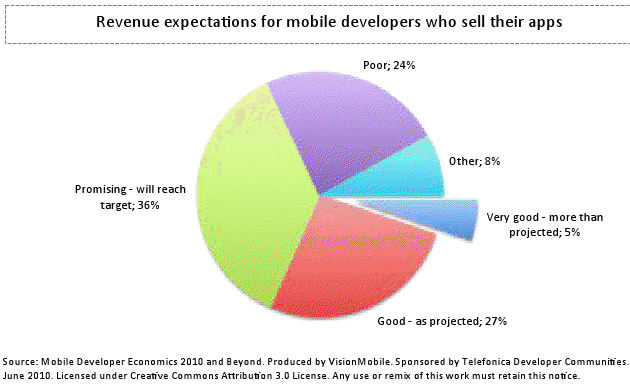 Moreover, half of respondents are willing to pay for premium app store placement. – The most important challenge in app certification is its cost; more than 30 percent of respondents who certify their apps report the high cost of the certification process as the number one challenge. The economics do not work for low-cost apps, but only for megaproductions. – The gold seems over-hyped: only five percent of respondents reported very good revenues, above their expectations. Moreover, nearly 60 percent of iPhone respondents had not reached their revenue targets. – Ad-funded models are only secondary revenue sources for developers employing app store and portal-based channels, lagging behind tried and tested pay-per-download models. Subscription models, meanwhile, mainly apply where the application is distributed via an operator or content aggregator portal; they have made limited inroads into app stores. 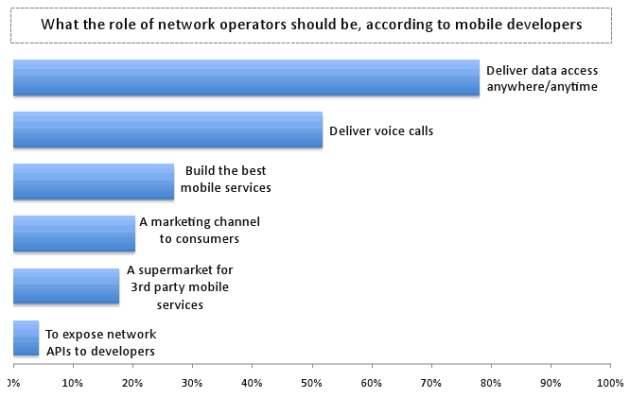 – Mobile developers view network operators as bit-pipes. Nearly 80 percent of respondents think that the role of network operators should be to deliver data access anywhere/anytime, while only 53 percent considered their role to be delivering voice calls. 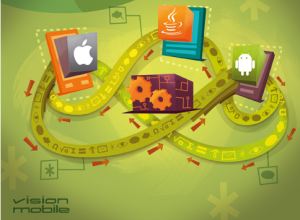 – The learning curve varies greatly across mobile platforms. 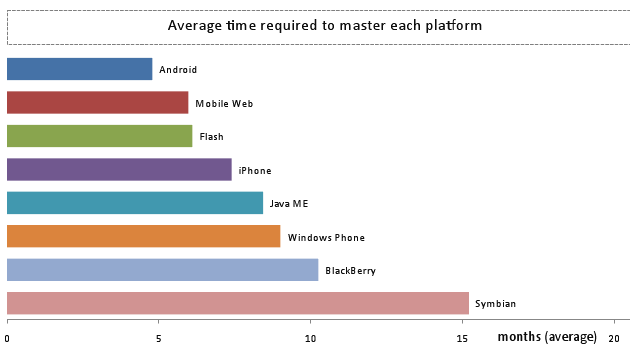 On average, the Symbian platform takes 15 months or more to learn, while for Android the average reported time is less than six months. 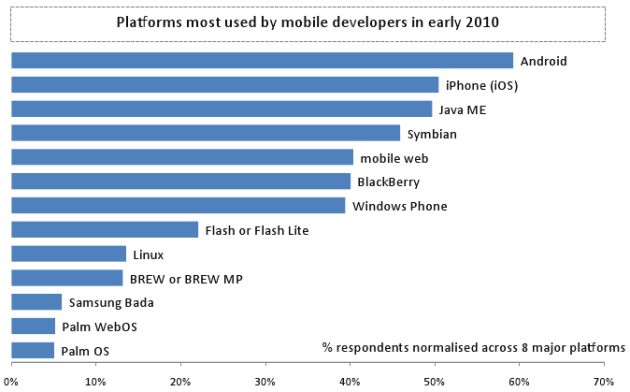 Moreover, Symbian is much more difficult and time consuming to program than iOS (iPhone), Android or Java ME; benchmarks show that for developing nine different typical applications, a Symbian developer needs to write almost three times more code than an Android developer, and twice as much code as an iPhone developer. – From a technical perspective, top pain points for mobile emulators and debuggers are slow speed and poor target device mirroring. Top pain points for development environments (IDEs) are the absence of an app porting framework, and poor emulator integration. – In terms of debugging, ourbenchmarking shows that Android has the fastest debugging process, compared with iPhone, Symbian and Java ME. Debugging in Symbian takes up more than twice the time it takes on Android. – Ability to build compelling UIs is still far from the reach of most mobile developers. Around 50 out of 100 Symbian, BlackBerry and Windows Phone per platform respondents are annoyed with the difficulty in creating great UIs. – VisionMobile’s research indicates that the majority of developers – more than 80 percent of respondents – rely on community or unofficial forums for support during software development, while websites are used for support by only 40 percent of respondents. – Access to unpublished or ‘hidden’ device APIs is a control point for platform vendors, but it is also what developers seem to be willing to pay for – in fact, more so than any other type of technical support. Hence, platform vendors could benefit from tiered SDK programs, where privileged SDKs are available to developers on a subscription plan. – Operator network API programs have so far failed to appeal to developers. Only five percent of respondents thought that the role of network operators should be to expose network APIs. Yet more than half would pay for billing APIs, followed by messaging and location APIs. – On average, 86 percent of respondents who use open source at work use it within development tools such as Eclipse. Android and iPhone developers are three times more likely to lead open source communities, compared to Symbian, revealing the contrasting pedigree of the developer communities. The single key drawback to open source reported by 60 percent of respondents was the confusion created by open source licenses. The full report is available for free at DeveloperEconomics.com.